Good app I love it an I would recommend getting this if you own a PS4 or whatever. I can’t get it to load I get an error code that doesn’t exist when you search it on playsations website. The app is nice and quite good, it just need supervision for maintenance from time to time. I need to be able to see captures. I always leave my PS4 in rest mode in order to let things download faster. So it would be a good idea to let us know the status of our downloads or updates. Can you add an option to view clips that were previously recorded? So I used to use this app a lot, especially for buying games and downloading them when I am away from my ps4. But recently it’s become a hassle. It asks for my password like 4 times, sometimes it starts the whole process of buying stuff over again. Sony, I want to give you my money. Please stop making it so difficult. Wee need you to add a capture gallery like Xbox more people would use this app. App was terrific till I upgraded my phone to iOS 12. Now it won’t even open. Send help. One of the best features of the app was seeing who is in a friend’s party/game session. How could you just update and remove that feature expecting this to be an “upgraded” app experience. You took off the one thing I downloaded it for. How can I get an old version instead of deleting the app altogether? Also... can you input an option to switch between accounts? I’m sure I am not the only person active on more than one account. It would definitely save a lot of time and make the app just a bit more convenient, but please... PLEASE bring back the party viewing option. If I want to purchase said game, I would use the PS Store feature within the app. I’ve never used this app and I’ve seen the reviews from a year ago and they are good but,It hasn’t been working for me it tells me a Error has occurred and I want to see if what the people in the reviews are right about how I can see my friends online if I’m not home.But I haven’t had a chance to see it so please fix it I would really appreciate it. Thank you. Removing the ability to see who my friends are playing with was a BIG mistake. It just takes me to the store page for the game they are playing now. This was a greedy change to try to sell more games. They constantly make stupid decisions when it comes to their products and for this reason I am most likely switching to PC. Why did you remove when i check on a friend’s profile i cant see who theyre playing with!! It takes me straight to the store when i dont need it! Such a bad update! Clicking on party session just takes you to game details now, you can no longer see who is in the party. Hope that you update this soon. This app no longer works with my ipad air 2 it just keeps saying an error has occurred. (CA201.1) and it does this every time even when I restart the app. The app is good . But I really think it’ll be convenient for one to be able to join PlayStation parties via the mobile app. Please make this happen..please. The PlayStation app is amazing and has almost everything I want. That is why I have it a 4 star. The one thing that I would like to see in the future is having the video/screen shots from the users gallery accessible from this app. I know many times where I wanted to show my friends this amazing clip I have but I cannot because it is not available to me other than on my PlayStation or if I download it and wait 30 minuets. This isn’t a need but if would be a great accessory to this app if it would be included in the future. I have a new account and my old account is stuck on app. I deleted and downloaded and I’m still logged in. Liked the PS4 back a decade ago...but. Do not think I am against Sony with some chip in my shoulder. On the contrary I loved the PS4 not for gaming (HAh!) I preferred it for Blu-ray movie playback. Moving forward to 2014 I purchased the Samsung UN65HU8550 along with the Samsung UBD-8500 4K Blu-ray Disc player with 3D playback! Now moving forward I lucked out when HDR technology came onto the scene because My Samsung TV came with a surprise “One Connect” port via purchase of the Samsung 2015 model Evolution Kit 3500 model. Thus replacing computer board with faster OS adding 4 HDMI 2.0a ports updating to HDCP 2.2 copyright allowing 4K Data pasa through with the much needed HDR upgrade! After my 4K TV and 4K Blu-ray player were setup, I calibrated the 4KTV with Settings to take your breath away! Unfortunately, when Sony finally got around to their aging PS4 I was praying the folks would wow me and family with top quality new device, awesome update! The only thing I got was support for HDR mainly. :-( I was angry! One thing that was handy with my two Samsung devices...once 2 name branded Samsung devices were connected together with power and Ethernet cable, the 4K Blu-ray player enabled BD WISE mode!! (Optimizing settings further for even better streaming or 4K Blu-ray playback! Back to my “updated PS4 dinosaur system with HDR was BAD as in awful!! Shame on you Sony. I know that Sony sits as one of many major company execs with monopoly on UHD, HD and SD codes for Playback. Sony and companies receive royalty fees every time codes are used for that digital playback. I wish more effort would have been used to develop a new iPhone system ... I was just disappointed... oh well! Such a small but useful feature they just took out with this latest update. LET ME SEE WHOS PLAYING IN SOMEONES GAME SESSION. Now whenever you press on someone’s game session it just takes you to the store for that game...fix this ASAP. Every time I try and open the app it keeps saying an error has occurred. Can’t even sign in And please get rid off the robot verification it’s annoying. I have been unable to use this app for as long as I can remember. Every time I launch the app I get “Error CA201.1” and then nothing. Funny enough that error code doesn’t even exist on PlayStations website. Hoping to get some type of fix for this ASAP. Crashes every time I attempt to redeem a code manually. Very hard to use because the app isn’t designed for the iPhone X layout. Wish there was more functionality here. Very basic. I find it very ridiculous and frustrating that I can’t look at my clips on the PS App, and I’d have to all these other things just to save it onto my phone. Please just up it so the community call easily see their clips on their phone. We need access to capture gallery! Good to see if your friends are online Incase you want to get online. Every time I open the app, it shows the button to automatically log in with “Continue...”, this always takes me to the login screen, every time. I’m not wasting my time trying to remember my log in every single time I ever open the app. It’s a constant struggle to cast your purchased video to any Smart TV. Sometimes it works, most of the time it does not. If you only plan to watch your purchased movies directly on a mobile device, then it works perfectly. But for the majority of people who like to watch their purchased produced on any large Smart TV via casting, it is very inconsistent and unreliable. Sometimes it will play for 7 seconds, then sit and do nothing. Other times, the app indicates that it is transmitting briefly before going back to the movie select screen on your phone. Hulu, Netflix, Amazon, they all have this figured out; Sony is either incompetent or they are deliberately causing inconvenience to push you towards their products. Only ever purchased two movies from the PlayStation store but will never do so again since my access to a fully priced movie is so incredibly and severely limited. Again, unless you plan to always watch from your mobile device or a PlayStation, do not even bother. Is not loading friends list properly, hope they fix this issue. So, ever since I got this app, It would either show an error message or close on its own. This goes for the rest of PlayStations apps. I was looking forward to use this app but it just doesn’t work as intended. PlayStation, if you see this, please fix this problem for iPhone. Love the app but I should be able to control everything like Netflix, Hulu etc. And we all know it’s possible. I am not a app dev but would it be that hard for you to open the PlayStation app and see your games that you are currently downloading from your play station and also be able to add people as play station friends from you phone both of them are just a suggestion. The app used to work for me since 2017 but now after that i been recieving the error code CA201.1 and there is NOTHING i can do to fix this issue... the app won’t load for a second PLEASE FIX!!! The app is awesome, but could be better if you didn’t have to have a separate app for messages. Like a thunder response great jobs! I never had a problem with it since I downloaded it. The past week or so every time I open the app I get an error code CA201.1. It’s very frustrating. When the app was working I thought it was decent. I do wish that I can see screenshots in landscape mode. It’s kind of odd that it can’t do that. Anyway, please fix the error. Thank you. All of the separate PlayStation apps could be one application. Not downloading this hot trash. Just wanted to look at my Spider-Man trophies to see what I am missing and after installing and uninstalling 3 times the app keeps coming up with errors before the app opens. Bring back "PlayStation" app name, instead of "PS App". Integration of Messeges would be also change for better. it’s like a you implemented a browser in this app, you should make it like xbox app i mean less browser like more native app like. I’ve gotten an error code every time I enter the app. I’ve tried to turn off my phone, close the app, and delete the app. Nothing works and it’s really frustrating. Please give an update that people on mobile can talk and go to ps4 parties. It doesn’t save my changes. I had switched to have only be notified when only one of my friends comes online. And every time I switch it back to to ALL friends, it still only notifies me for that one friend. What the heck dude. Every time I try to edit my bio I would tap the box and it would light up but do nothing. I can’t edit it. Fix this thanks. App is fine for just the basics but not entirely all. It makes no sense to have to download a completely different app to send a message to a friend. This seems like the the Facebook app. It’s called the PlayStation app for a reason, I thought I’d at least be able to do that but I’m not gonna waste time having 2 apps just so I can use one for the simple purpose of sending a message. This app is a very good companion app for my PlayStation 4. The only thing I wish Sony had is an app where you can get your videos and screenshots you’ve taken on your PlayStation that lets you save them to your phone’s photo gallery. Playstation is the best Xbox is trash. NETWORK CONNECTION LOST how to fix this ? I had the app on my last iPhone, and I changed it to a new one and now when after download the app it doesn’t work and appear a notification on screen saying network connection lost. Bring back the option to remotely access the console. I want to be able to use my phone as a remote to navigate around as well.. More importantly, I need to contact my contacts. I get stoked when I see a friend online, but I can’t get ahold of them anymore or at least let them now I’m on my way. Why get rid of this important feature?! Please, please.. please work on this for us!! I had an old account linked to it and then i got a new account and when i tried linking the new account it kept asking for the old account information (because it was saved on the cloud) so after a week of searching for the paper that had the old information, i signed into it and tried to sign out so i could pick a different account. When I tried signing into my new one it said the information i gave it was wrong but i had just made that information 2 weeks prior so i know full well it’s correct. Called playstation support and they couldn’t help. Remote play please!!! Sony shall not miss the great opportunity to expand user playing with PSN games every where! PSN game is great now, but I am rare sit in front of my TV, so I am considering more portable game like NS, but if Sony support use remote play function with DS4 on iOS, I definitely buy more PSN games because I can play it on the way. so i logged into my brothers account by accident and i don’t know how to sign out to sign into my own ,, anyone help ?? Hasn’t worked in a year!!! I haven’t been able to get the app to work on ANY of my devices (all Apple)!! For nearly, if not over, a year, I will install the app, open the app, only to be greeted immediately with an error message citing network connection issues. I have tried this on and off WiFi, but neither works. This is unacceptable. PlayStation, get your poop in a group. Used to work fine till few months ago. Pop up error when open the app “ An error has occurred “.... Restart, delete app and install, clear cache, update iOS version use WiFi and data and update the app recently but nothing nothing work for few months already :( I google it but no solutions for that prob. Why can’t we view our video clips like the Xbox app allows? I think you should be able to write Messages and also see other people’s or friends messages. 80% of the time I try opening it, it says error and then crashes. So Dear Devs, if you are ever wondering what features you could ever implement into the app to help it grow... I’d like an option to be able to switch between accounts. It’s time consuming to constantly sign in and do the Captcha. I am active on more than one account and it would be a great benefit for me and for others, I’m sure. I cannot rate this low enough. The UI is too messy. Adjusting Wallet, address and other basic information is a mess to figure out. Each segment feels like a different app. To top it off, I cant even complete a purchase if I wanted to. The ps app is great but I have one complaint, I just wish you can see your video clips in the app instead of posting them to YouTube or something to watch them on ur phone. PlayStation if you see this please add a feature where you can see your video clips in the app. Stupid, make everything into one app again already. You Should Add a Party Feature To The App So All The PS4 Users Can Be In a Party Without Headphones. The friends list on the app hasn’t loaded for me for the better part of a year, and it keeps spitting out an error code (404.21700c) that doesn’t seem to exist. Messages App works just fine, so I don’t know. Keeps failing to open, says network connection lost every time! I hope that one day we will be able to connect to the party system function of the PS4 using the app, it would be useful for people who have friends online and want to watch and be able to talk without disrupting the other players by making them switch to Skype or another third party app. Please make it possible for us to join PSN voice chat rooms via iPhone! I've had it for a little over a year and I cannot even begin to explain why, it has never worked right, 49 times out of 50 you'll get "an error has occurred", of course that's even assuming the app will even load in the first place. Hysterically terrible. I have both consoles and enjoy both thoroughly. The PlayStation applications are horrible it takes 3 applications for your phone to have the same functionality of the single Xbox app.Even then the PlayStation apps have not worked very well. I love both my consoles about the same (admittedly my Xbox a bit more) but the apps just don’t work very well and it’s a bit frustrating. It’s needs it because I have played a lot of games and it takes forever to find a game. I like it because you can take to your friends on the go. Every time I try to open the app I get a connectivity bug that makes me close the app or infinity try to load in I have tried on multiple different networks and have had no success. This app is really useful to message your friends when offline, but I wish we could also talk to them in their parties through the app. Is there anyway that could be implemented? The app isn’t bad by any means but does require a major upgrade, one to where users can message friends within the app and turn your PlayStation on when not connected to the same WiFi when allowed by the ps4 user and iPhone which would be convenient when wanting to turn it on prior to getting home. What makes this app bad though is the layout what is it like seriously. The layout is plain out trash make it more new and something the users will actually want to click on and use. The app has some convenience but I’d had a better layout it would still be on my phone. That is really all just a few updates to how the app looks the make it smoother and better, also fix a few errors within the app and it has the potential to be a 5 star. One great thing that could be added to the trophies are percentage. That way the user can keep track of the progress. Very easy And useful to Use especially when to check up on seeing if you're friends are online and Sending messages with the Ps messages App without literally having to turn on the entire Console. Listen PSN no hard feelings at all but why THEE HELL can xbox players still 1 up me by showing me their clips from their phone ?! come on guys this is a HUGE feature please add ASAP. DO U THINK I DONT WANT TO SHOW PPL MY SAVAGENESS OUTSIDE OF MY HOME WITHOUT STREAMING ?? Open it and it just says “Network connection lost” over and over. No explanation. No troubleshooting suggestions. Nothing. BTW, the network is fine. YouTube, Safari all work. Speedtest shows 100 Mbps. The app keeps crashing with a constant "Could not connect to network" every time I open it and to fix it I have to reset my network settings, which is really annoying. And when I look up the error code it gives me it tells me it's my fault. Nope. This is clearly Sony's fault. I have no connection issues on any of my apps on my phone that sign into a network. Fix it and I'll download again. This app needs a function to allow you to join parties on your phone. So not having a mic will not be an issue. We need update for new software cuz doesn’t work on 11.4.1 ios. Best app for my PlayStation! It’s pretty good but the should make it so you can join a party with friends. This app is great but the notifications I had removed from my PlayStation still appear on the app. Could you make a way to remove notifications on the app. I can not go back! When I enter a shop game detail page, I can not go back. Only close , then open shop game list again. Preface - I’ve posted an identical review on the Messages app bc both will not work for me. I would love to use this app but unfortunately it will not work at all. I’ve downloaded and uninstalled the app countless times but I can’t even get to the log in screen. It loads and says “Network connection lost” from the moment I open and the “try again” button never produces a different result. I’m on an iPhone 8 and the newest iOS as of August 13, 2018. If ANYONE has a fix please help me 😭 Googling and going through forums didn’t solve my problems either. I love the PlayStation app. It lets me buy and download things while I’m away from my console. It lets me know which of my friends are online. Checking out my trophies is another plus. I wouldn’t change a thing with this app, it makes everything so easy to do. Resetting password is broken an wont work continues asking me to click stupid signs an card to verify I’m not a robot I clicked about 100 times tryna get to the next step plzzzzzz Fix this!!!!!! 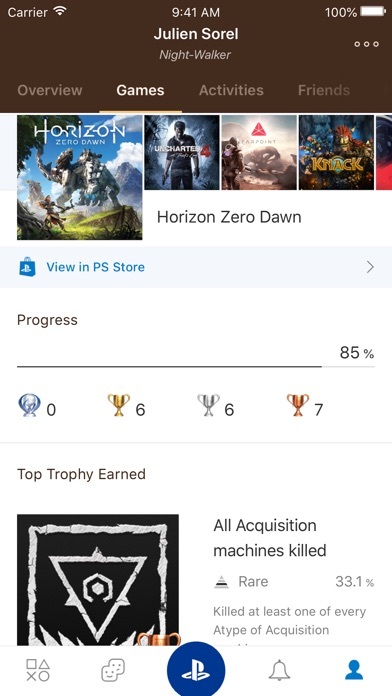 Great app to check games, access the ps store, communicate with friends and access basic account functions and trophies. Have to type in password all the time. Nintendo’s Switch app allows Touch ID login. Very handy for parental controls. Also, Parental Controls in the app seem like an afterthought. Should be easily selected in the main dashboard instead of digging into Settings/Family Management. This app won’t even open . Says “network connection lost” every time I try to use . It does some things... Not nearly as good as the Xbox app currently is. Love the app so far, but one suggestion. Make it to where you can access your screenshots and videos that you’ve captured and be able to download it straight to your phone. You guys have many PlayStation app on the App Store. Another app you guys should add could be a Party app. Like you know the party app on the PlayStation, you should add one on mobile. This will help lots of people that don’t have head sets or microphones. With this app you could just open it and go to one of your friends parties and talk from your phone. The inconvenience of constantly having to sign in. Why is it that I have to constantly sign into BOTH apps in order to use it? Update the app, sign in, don’t use the app in three days? Oh yeah, you better believe there’s a sign in coming. The worst part is that the password detection is sketchy. I know my PW. Yet when I put it in it says WRONG. then you have to do the stupid “prove that you’re not a robot” thing. Uh. The playstion app is really great to see what others are doing same with the ps message app. My only complaint is that there is no player is online option where I can see that one of my friends I put show online is not on there. After latest update, can’t get beyond the 20 thousand captchas. I don’t have much to say because I don’t know how the app preforms because when I try to open it it says “network connection lost”. No matter what I do it just never loads. If they could fix this problem or someone can tell me if I’m doing something wrong. And no it’s not my internet connection I have fast internet speed and I tried everything and it will not work. Their app is so dumb. The server connection keeps timing out and can’t even log in. I have problem in the app not open in iraq I don’t now why But It works when i use VPN !!! any help!? This app needs a stay signed in feature or passcode/Touch ID feature. I’m being asked to sign in more than my banking app! You should add the feature were you can talk in a party with earbuds and a mic through your phone. On the Xbox app you can talk in a party through your phone. PLEASE ADD!!!! The PlayStation app is really good it hasn’t given me to many problems, but theirs times where I try to log in and it won’t let me in for a couple of hours or a day but that’s the only problem I’ve had. It’s awesome app PlayStation. I like being able to see who’s on when I’m not lol. Recently after I updated the app to its latest version. The app WILL NOT work for me now. It won’t let me sign into psn on my phone anymore. Same goes for messages. The app worked just fine until it’s latest update. I don't see the button to post pictures from my phone into the What's New section and my app is up to date. The app itself looks better than it use too. Cons would that it keeps crashing and logging me out. Also, it has a separate messaging app. It should all be included in one 🙄 Please fix thissss! I tend to get a error message whenever I try signing in on the app or online. Sony need to get it together I have a lot of money and time spent on my account and it’s down for something about maintenance.i never got a warning or nothin about the situation only time will tell when my account will allow me to sign back in!!!!!! Every Time I go on the app, it just says "An error has occurred"
I just updated the app to the latest version today and every time I open it up, I get an error message saying “Network Connection Lost”. I removed the app and downloaded it again and I still have the same issue. I might be inclined to use this app if it ever actually worked. This app is difficult to use with keyboard since it’s vertical only on iPad. Edit: great update, finally landscape mode. Went from 2 - 4 star rating just from that. My app won’t let me log in it loads for two seconds then says lost connection and I got 5g WiFi. And everything else I could possibly use to sign into PlayStation network besides my PS4 I go to google safari my computer my iPad it just doesn’t load the sign in page and even on the sign in pads on the destiny companion app won’t let me sign in but u can still sigh in to Xbox live and battle.net. This doesn’t make any sense. Fix it! The apps don’t work when my PS4 is in rest mode ! None of myPS apps will work unless my ps 4 is actually on and not in rest mode I get network connection error messages or it just won’t connect ! Contacting support takes me to the Sony page but there is no option for mobile ap support ! 7/24/18 UPDATE: This apps seems to get worse. After the app updated, I can no longer login. I start the app and it stays on the loading blue screen. I deleted it and downloaded it again only to get the same result. I deleted it again, restored and wiped my whole iPhone, reinstalled it and the app does the same thing. I give up, so it gets 1 star for not working at all. iPhone 6 Plus - iOS 11.4.1 This app is extremely slow (when it works). I'm always getting timeout errors, I get a notification that I have a message but it doesn't always load it. So I would have to actually turn on my PS3 to read it, making this app useless. And please fix your slow network. Where is faceID for store purchases!! This app was great now I get a “Network connection lost” whenever I try to open it. It used to be great, but now its worse. No horizontal support?! It’s ridiculous that you need a separated app for just the messages. 2 apps, are you kidding me? Why can’t it be just one for everything?? We want name changes!!! I have at least 10 friends who hate their name and want to change it. My name is harrisfamily7262! U know how much crap I get for that?! I don’t want to make a new account for obvious reasons. I surveyed a bunch of friends and averaged out we said we would be willing to pay $30-$50 so please give us name changing!!!!! The app so far has been far good, it has been great. But the app could be even better by updating that app, by adding in a feature where you can look at all of your saved clips and pictures from your PS4. Most of the time when you want to show your friend a cool clip u have to be on the PS4 then record it on your phone. With adding a feature where the PlayStation community can show clips and pictures to there friends through the phone would be very useful. This will draw more people to PlayStation and also downloading the app, hopefully the Sony can add this feature which will really benefit the community. I like this app alot, it's my go to for checking invites, who is online etc. I hate using a controller to type and avoid it at all costs. This is a great way to check my friends lists/notifications without interruption of what I'm playing/watching. -1 star because there is no "party" tab. I don't need the ability to join parties, but I'd like to see my friends parties/info about whose in the party. I love having an app to access my PSN account to make changes etc, but it feels like it’s just the mobile website contained in an app, which I might as well just access through a browser. Biggest issue is the UI set up. The PS “button” feels unnecessary when there could just be a separate page to access the same list of options. The store and store search options need a lot of help. Really just feels like a buggy mobile site, and the search function is very limited. I really appreciate that PlayStation is trying integrate smartphone use with their console, but it really just needs to be updated and streamlined. I Love this app, I use it mostly everyday to keep in contact of people I play with everyday and it’s a easy way to keep updated with who’s online. Keep up the good work! Can we at least be able to see our recorded gameplay?? There needs to be access to clips that you have saved! It would make it so much easier to share. Man, I wish this app could allow to play, pause, fast forward and rewind video/audio. I hate having to drain my controller just to watch videos or listen to music. Please add this. I'd be okay with a separate app. All the PSN Apps are not working on my phone it keeps say network connection lost every time I try to go on them. The last version crashed pretty consistently within the first few minutes of use on the latest iOS version, and I was hoping the newest one would fix this. Now it crashes about 10-15 seconds into use. Completely unusable. Love it but when I go to sign in it says “an error has occurred” what’s that about??? I feel like if you’re downloading something such as a game, there should be a notification option that lets you know when it’s done. To be honest, here’s what I think. This app is awesome, I use it if I have to go on vacation or if I’m away from my PS4, this app let me search the store and download games when I’m away, this app is pretty legit, but here’s one thing I have to say: One time all the features were combined, but, they turned into separate apps, i’m not complaining. (i’m just saying most people are talking about it and I want to talk about this as well) Hey, at least I can see Games when I’m gone, this app is pretty much a must buy if you’re going on vacation, you should download the app first before downloading the second apps, therefore this app is amazing. This doesn’t support landscape, making the app unusable. I have an iPad Pro connected to a keyboard so I’m only able to use apps with landscape. In 2018, it’s sad that such a big company would be this negligent. The account setting is way too difficult to navigate. I have tried to log out of my account and add a new account onto the app but I couldn’t find out how so I looked it up. But it was nowhere on the Internet. I’m just trying to change the pfp for my other account. I initially downloaded it for the purpose of having a custom “real” picture on my PSN profile, but I really enjoy the various uses such as being able to check up on a friend’s online status, sending them a message as it’s far more convenient I then on the PS4 itself, and so on. Well-designed app and easy to navigate around. I Have This Pet Bug And It Crawled into my PS4 so now when I turn it on the screen shows a giant bug ps help me. The app won’t open. Bogus! Every time I try to log back into ps4 app it always tells me that network connection has been lost, and there is seem to be no fix to it for me to do. Please fix sometime in the future. It is very poorly made crashes and constantly says my credit card number information is wrong even tho it’s not. Very annoyed with the app and PlayStation as a whole. Get it together. PS4 get your stuff together please. Never really works. Got a weird error trying to log in and no one knows what it is or why it’s happening. That’s just the start. Not satisfied with my ps4 either. It doesn’t run well and constantly lags and sometimes freezes. I bought the unit 6 months and 7 days ago. I am now purchasing an Xbox due to its actual functionality. You will also be able to find one more ps4 1-terabyte demolition video online. It logged me out and i can’t log in anymore. When i tap the text box the keyboard comes up for a fraction of a second then goes away, making the app useless. This has been happening on iPhone 5s and ipad mini 2. The app worked on my phone until it logged me out. The status says all services are up and running. It seems this app isn’t cared for any longer. Still functions but could seriously use some updating. And maybe think about merging ps messages and this app into one... having two is a bit ridiculous. And please, add landscape mode! I can’t stand using this app stuck in portrait mode, but I don’t have a choice. Despite the negatives, this app works fine just not crazy about it. 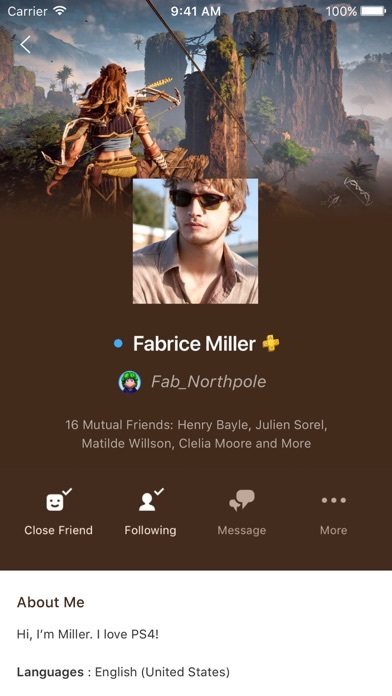 we need a new feature that can have us join parties through the phone that would be amazing other than that the app is great! Love the PlayStation!! The app is so easy to use!! Who else can’t sign in? Asks for my credit card ccv over and over again when I try to make a purchase, and eventually tells me it's failed to connect too many times and to try again later. There is no error message or indication that something has gone wrong other than nothing happens. Quando se acessa uma segunda tela, não há opção de voltar pra página anterior (fazendo-se necessário fechar a página e começar novamente); ao tentar efetuar compra, aparece um banner explicativo que não é possível retirar da tela senão pelo 'X', mas aí volta na tela anterior e não permite avançar com a compra (perdi um desconto de bandle por conta disso)! I can’t use the app. Every time I open it. It always says “Network error”. Please fix this. Can you please add a feature to be able to see your clips on your phone. Every time I go to my friends or cousins I want to show them my clips, I would give it a 5 star if you do that because that would be really cool. Everytime i try to sign in it says error occured and goes back to my home screen!!!! I’ve tried to use this app for months. I’ve downloaded it several times and when I go to sign in, I can’t press the sign in button. Probably a good app, if I could actually access it. Where on earth is the landscape mode for iPad? Wish you could see clips and videos that you have saved. انا جهازي ايفون ٧ بلس ومايشتغل 💔! The one thing I would like is that they combine the messages and video apps into one. It would make it much easier and simpler. Also, why can’t I buy movies on PS Video or this app?? Helps out a lot,very good!!! You should be able to find or access your clips with this app!!! Ps App is Good but could be Great. Playstation you gotta check out the Xbox App and learn but do things in your own way from what they have within their App. Xbox App offers more control and personalization, able to view game clips and parties and much much more. Every company makes themselves better with new ideas to be honest just check the Xbox App and offer more for the Ps App which could honestly be Great but needs more work and things us Gamers can do on it. I really lIke the app, it’s different. The only thing I have a problem with is that I can’t use landscape view on my iPad and that is irritating at times! I just downloaded the app. Once I launched it I click the “Sign into PSN” the a tab launches up then back down saying an error has occurred (C-F0000FF) Can you please fix this or help me out? Very helpful to check your stats and stuff away from home or wherever you are. Do not link your Epic Games account to your PS4! It will permanently lock this third party account to your Playstation, and you will never be able to use it on any competing system ever again! Everything you’ve purchased or earned on that account now belongs to Sony, and there is nothing you can do to get it back! There are only 2 things I want from a playstation app, and this has neither of them: the ability to send messages and the ability to turn on/off my PS4. The fact that there has to be a separate app just for messages is obnoxious. Add messaging to this app and bring back the remote control feature. Uninstalling. Great app , stopped working. I've tried downloading this app on two separate occasions. One on my iPhone 6, another when I got my 8. Both phones has different carriers. Both times, I launch the app and am immediately told "Network connection lost". I've tried wifi and data, it doesn't change anything. I never even see a login screen. My app no longer opens, none of the PlayStation apps do. It worked fine before. When I connect to the app, it says “network connection lost” and then it stays on the loading screen forever. Make a way to import clips to the mobile device . Like adding a PS clips app or something. because it would be very useful for lots of people. Right now I have to post my videos on YouTube and download them with another app then delete them off of YouTube. And it would be useful for lots of people using i movie. Need to add the capture gallery to watch replays!!!! For some reason, whenever I try to buy an item from the PlayStation Store using my credit card, the order never goes through. The app asks me for the 3-digit security code on the card, and after inputting the code, and app asks for the code again. This cycle repeats until I’m locked out of purchasing items because of “too many attempts”. This is the one part of the app that shouldn’t be malfunctioning. I’m trying to give you money, just take it! Unable to use app because my username is already in use....you think so? Of course it is, by me. So if you already have a psn account you don’t get to use this...what a joke. I’m only writing this because you can’t contact Sony to let them know directly. Great app to see what sales are going on and good to see your achievements. Would recommend this for anyone with a PlayStation. Needs to be able to see the videos and screenshots on it from ps4 please!!! After that best playstation app! Great App, One major thing missing. This app is very convenient and easy to use, however one of the main reasons i downloaded it was to access my capture gallery to watch clips I’ve saved. However, there is no Capture Gallery feature, or at least i haven’t found it yet. The app is great when it works but it never can connect to the PSN when my phone isn’t connected to WiFi. I do have my date turned on for the PS App it just never wants to work for no reason. I’ve had this app for over a year and I’ve barely even been able to use it! I can’t even sign into it most of the time and continuously get an error message. I’ve tried closing app and reopening and even uninstalling and reinstalling but still no luck. Annoying “connection lost” error when connected to internet. Happens with almost every page click. Bleh. I expect better from $ONY. Great app, allows you to be updated with all PS4 features and connected with friends and community. The app is kind of redundant now that there is so many PlayStation apps out there. The interface could be improved and the store really need to be removed and just made into a link to safari. The store is just horrible in this app. What happened to movies and shows? It’s still a very good app for the game side of things for me, but one of the best features it had once was the feature to buy movies and shows for you to watch on your console or phone. Some people can’t be around their consoles to buy or watch movies and shows. This might hurt their money a bit if this doesn’t change. It used to work fantastically, but then this error called c-82E02716 appeared, now the app is useless and broken. So all I have now is I can’t connect to network even though my mobile network works just fine and along with my WiFi. Problems! Keep getting error message box when activating playstation mobile also keep getting DNS server error message when updating email address on profile. I’ve tried entering a redemption code manually and every time, the app crashes back to iOS. Seems like the app is less reliable than in the past. I have a PS4 Slim 1TB, every time I open the app, I see the blue screen, and get a message saying “network connection lost”. This message is all that's displayed when I try to open the app since the update. I've never had this before, everything else is working fine. It would be awesome if I could just pull my phone out and show friends videos from my gallery but sadly you can’t. This would be a great future update. Giving this app 1 star due to the fact that it won’t open. I deleted it and downloaded it several times, but nothing changes. It’s stuck on the same picture, the PS logo! Let us watch our clips on the app !!! It’s not letting me open the app. It keeps saying connection lost. If you guys could please fixed that it would be great. Big improvements from the last layout, and it fun to use. Access to the store and other functions make it easy to use. It’s awesome to be able to see what my friends are playing and check on my trophies real quick view all my friends games as well! Haven’t been able to use the app in months. Every time I try and open the app I continuously get an an error message. It’s quite frustrating to say the least. I’m using an iPhone and the latest iOS update. I’d really appreciate this bug getting fixed! 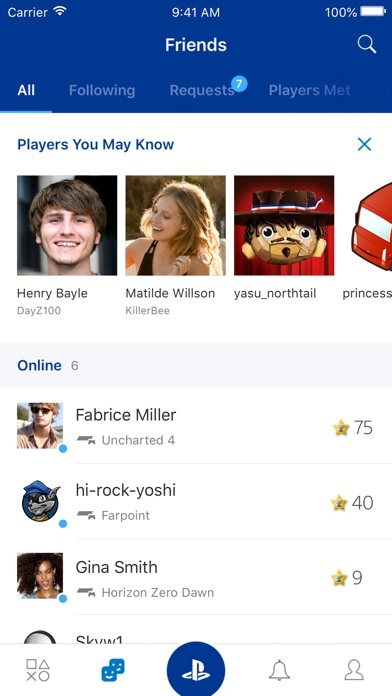 This app is amazing and I love how it allows me to keep up with which of my friends are online and who aren’t along with what games I can see and are interested in getting one day. The ”players you may know” functionality is no longer working, at least for me, both when using my ps4 & ps app in Europe. It used to always suggest around 40 people I might know but all of a sudden they all disappeared and now I’m hearing there isn’t anyone I might know. My guess is it has either something to do with the GDPR regulations being rolled out or with Facebook being under fire recently over privacy concerns (I’m assuming the ”Players you might know” feature worked using Facebook’s API in some way, and it’s now blocked) and having to bend on some policies to the European Union. It’s ridiculous a useful feature like that could go through I could best describe as a dark-deprecation in some regions and players aren’t informed it’s happening. It makes PSN and this app worse. Sony Twitter support wasn’t helpful at all and was elusive in their answers when asked about this. Shame. Doesn’t work anymore, I just got the app a week ago, and it still won’t work. This app needs improvements. Please fix app, thank you. Ever since they departed psn messenger to the messenger app this app has been horrid. No need for two apps. It doesn’t remember login credentials, slow login time, just bad all around. Xbox has a better mobile support platform. Every time I try to open it it says “network connection has been lost.” When it worked it was great though. Please fix this issue. When I open the App It says : « Network connection lost. ». Is it possible to fix this?????? It wouldn't even let me sign into my account, even though my password works on the web and on my PlayStation. Disappointed. It's good if you want to buy on game that's on sale while you're not home or just buy a game in general, or if you want to see who's online before you start playing. But other than that there's not much to do with it. Now my phone can blow up with fortnite game invites 24/7!! I think it is stupid how there are multiple apps for PlayStation such as PS Messages. As much as I dislike Xbox, they definitely have the advantage on their mobile app. Everything in one, like how it should be. PlayStation, please change it to one app for everything, it will be so much more convenient! Prove your not a robot takes a good 2 minutes, and god forbid you get your password wrong once or twice you’ll be trying to sign in for an unbelievably annoying amount of time. If you are using your PlayStation to connect to people then I can understand the changes. However, if you are using the app to keep track of your game play and trophies yet to be completed then this app has had a down grade. You would think that a game system would maintain a dynamic app where gamers could easily connect to a description on how to get a trophy, read other player tips, watch videos to learn other player techniques. PlayStation it seems is just focused on the social connection and definitely not the game play. Won’t even let me log in, it says it has a problem with the network then after you re-enter your information the login button is frozen. Would be nice if we are able to see our videos and screenshots from the app . This pops up every time I open the app. So irritating. The app is so buggy and outdated. Please update app and fix bugs. App crashes anytime I try to redeem a code manually. What’s the point? None of the PS4 apps work on the iOS system. It won’t connect and keeps erroring out. These bugs will need to be fixed if I am to use any of it. Bring back "PlayStation" app name, PS App... seriously? I’ve always had this app since I got my PS4. With that being said I’ve never had a problem with it until a little under a month ago. I still get my notifications through my phone and what not BUT when I go to the app it puts me at the sign in menu THEN when I put my stuff in correctly (I know it’s correct because I did it 7 times) it will not let me sign in and it says “Wrong Sign In or Password” even though I still get my notifications. Great and helpful app but until this gets resolved, it’s staying off my phone. Can you add A select button where you can unfriend the people you want inteed off having to go on the account unfriend them and back out it would make it so easy for people that got 500+ friends. Want it to work on Apple Watch. Like it for the most part. Add option to change cover photo! I got this app because I had trouble communicating with FORTNITE players on PS while I was on mobile. I was greeted with a sleek app that had no use whatsoever. Nothing seems to work, and please add the party feature so that you can talk to people playing on PS. PLEASE work on this. I literally can even sign into the app. Every time I click sign in it says error and shuts down. The app sits on a blue screen loading screen every time regardless if I’m on LTE or WiFi. Reinstalling didn’t help and neither did restarting my phone. I’m also on the latest iOS so please fix this. Very fast! It’s good to organize parties for people who don’t want a mic. You can also customize your privacy. Can’t turn ps4 on/off Lack of remote play makes no sense, Come on Sony! Why bother with this app? You'll spend all this time adding games to your cart and typing in your password just to get a message reading "Please purchase in your web browser." At least mention that on the confirmation page so I don't waste all my time! You guys should make it so you could use your phone as a mic. Ok the app is great I really enjoy seeing who’s online and all of that but my friends with Xbox always show me their clips on the Xbox app and I really want to show them mine but it’s so inconvenient having to post my clips on Twitter or Facebook just to show my friends them I would really like it if your guys made it so we could see our capture gallery on the ps app. I recently switched from Xbox to PlayStation (kept my one X, just joined PS4 for exclusives) and while I love the menus on the PlayStation, I am still just blown away that you can’t buy a game from this app using PayPal. It even gives you the option to use PayPal, and then when you choose that, it just says “to pay using PayPal you must use a browser” so then I go to Sony.com in my browser and try to buy the game there and it STILL doesn’t work. So the only way I can buy games using my PayPal now (the only thing I pay with to companies like this) is to actually purchase it from the PS4 store itself on the console. Which I think is stupid and inconvenient. Otherwise the app works fine, but this has been a problem I’ve had with the app since I first got it 4 weeks ago. Application won’t rotate to landscape mode on iPad Pro. I would have to remove my keyboard. Seems like a simple fix. The app is useful when I’m at work and a game comes to thought for buying but, however the functions can be a bit laggy. 4 out 5 times the app will freeze when going to the PlayStation store. The. I’m stuck when going into a category like “GAMES” and when I click on a game to preview the arrows aren’t lit for me to go back to the previous page, therefore leaving me to go all the way back to the beginning just to preview another game🤦🏽‍♂️. When it works it works very smoothly, chatting is simple, shopping is streamline. But it only works about .02% of the times I try to use it. It always just errors out as soon as I click it. 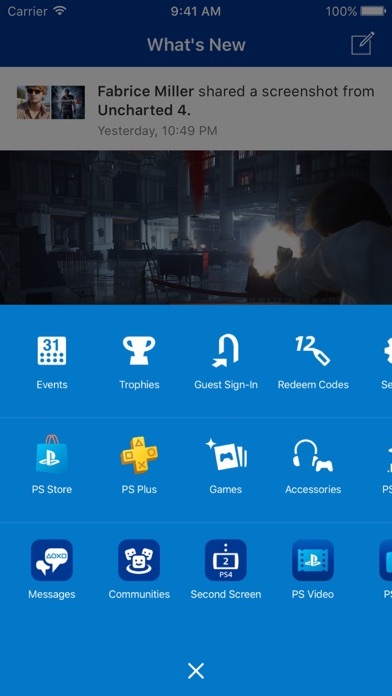 Make PS4 Party chat accessible from the IOS app. After that, this gets a 5 from me. When are we going to be able to access our capture gallery from the app? I have so many clips I want to show my friends but can’t unless they come over to my house. Xbox has their capture gallery available in their app so why can’t you Playstation. For a big company like Sony this couldnt be more incompetent. The app got divided into 4!!! apps. Who wants to download so much bloatware! On top of that, the PS Store opens. website tab!? Could you guys put some effort in it. Its been years and the app its still trash. Also where is REMOTE PLAY??? Big opportunity. Since the Xperia Market is dead compared to other flagships like Iphones and Samsung Galaxy phones. This app will be an instant 5 star when the party function is added to it. I and many others really want to be able to verbally converse through the app. The What’s New section is amazing! It’s basically like Facebook without the Zuckerberg, meaning the garbage that come’s along FB. Share your games and achievements, with just your friends or everyone around you. Tell one or two jokes, talk about an experience that someone “might” be able to relate. Should I dare say go as far as making a new friend, or two. PlayStation is an amazingly, awesome place and the What’s New section is an absolute delight. 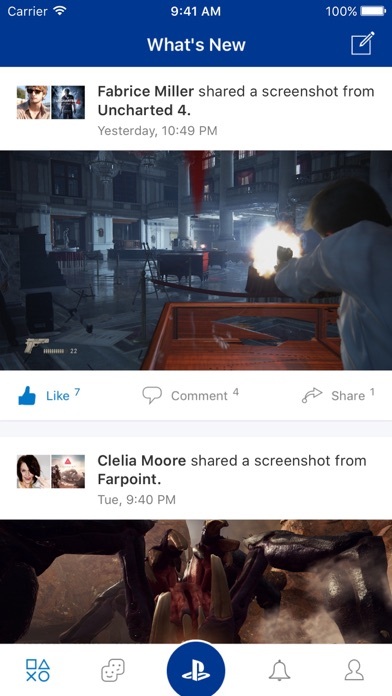 FaceBook is....ummm meh, but the PlayStation What’s New app is better. Every time I try to enter a PSN code manually the app just crashes. When scrolling to view games it automatically clicks to preview the detail and when you use the back button it starts the list ALL OVER then I have to scroll back to where I started to begin with. Please fix. It’s getting ridiculous. Can’t sign in even though everything is correct. The PlayStation app has lots of good features and helps me know when to play on PC or PlayStation. The big problem is that for user that doesn’t use the PlayStation app very often I often find myself signed out of the PlayStation app every update! Is insanely frustrating because I would love to be able to talk with people that are messaging me through my phone instead of having to turn on the PlayStation but I have to sign in again and again and sometimes my password doesn’t even want to work on here. The worst part about the app is that it’s separated from the other two core features of PSN! Communities and messages are both part of separate apps where as with Discord there are no separate apps for different features. Even Xbox is better than PS in this area. The PlayStation app needs to be turned into one app not three, And the app needs to calm down with its security settings. I’m not hosting a US nuke control server via PlayStation... or am I? I would have started at 4 stars and then given you 5, but I felt like you wouldn’t fix what I’m asking for. I think the UI is pretty good and works fine on iPhone X and I have few issues with it. BUT, there are 2 things I REALLY want changed and I don’t know if I’m alone here, but I think they would make the experience a lot better. 1.) On the PSN feature of the app, it is confusing to navigate. The part that is confusing is the back button. It is too hard to find and the X button kicks you out of PSN leaving you to start all over. This is annoying esp if you are shopping. 2.) I use the PS Communities app ALOT and I like to post photos. Offline! It would be nice if I could access my photo gallery from my phone, even if it meant being hooked up to WiFi and being in the vicinity of my PS4. Now, is that asking too much? If not, please change this. Thank you! Sony needs to hire the people who designed the Xbox phone app because THAT is how a gaming interface phone app should work. This app needs a ton of work. And why do I need a separate app to control my PlayStation from my phone, why is this app and the second screen app not just one app? Recent update ruined it. Can’t buy or download ps4 games to your console from the phone anymore. It’s telling me people are online when they are offline I’ve already uninstalled and installed again problem didn’t go away. I like the app just wish there was one function. I enjoy the app and all but I wish that it let me review my game videos that I saved on my playstation because sometimes I want to show friends some amazing clips I’ve got but I can’t show them unless I have my PS at their house. Title is self explanatory. There is no landscape mode on the iPad. A dumbfounding decision by the app developers. Was better, but they removed the function to change your profile picture... No real use anymore... I only use ps messages now. Some of m friends have Xbox’s and with their app they can join party’s and even look at saved clips. This app would be so much better if it could do all those thing and more. I don’t know why but for some reason I can’t seem to use the app. No network connection keeps popping up but I have internet. I am having trouble adding my device to the ps4, I tried both ways, Is there anything I can do to fix it? Running on iPhone 7 Plus -Please add trophy sorting like on the PS4 -The Playstation App tends to display the users trophies instead of other players trophies when viewing their list -Add trophy sorting when comparing trophies with other players -Please Add option in settings to already show hidden info instead of clicking on the separate trophies individually ***I love earning trophies for Sony Rewards and Status, so it would be a blessing if you would make it easier to view trophies and sort them as I do not like the idea of using third party apps!! Make it so you can watch clips that are saved on the console through the app. Great app but... There is one thing that would make it really good. If you could see yours and other peoples clips that they have made the app would be good. I keep getting error C-82E02716 and even after deleting the app and reinstalling i still get it. Fix it and i’ll change my rating but until then it’ll stay at 1 star. It is a good app but what I would like to see is that you can join parties through the phone when you are not playing on the PS4.So you can talk to your friends/family. I love this app and all its features are very useful. However as well as lots of other people, I believe this app really needs a way to view saved video clips from PlayStation. Trying to change my avatar but i error saying connection was lost. This is a great app and everything, but without the capture gallery it feels boring. We need to be able to show our friends what we did that one day and show them the video to prove it. Or show them how good they did against someone else and back it up with a picture. If the capture gallery was on the mobile app, I’m sure the app would be way better. You could just input the amount of money but now it’s either 10 25 or 50 dollars it’s stupid trying to get something that’s In the middle. Crazy app, you need to reset your password every time you try to use it! Great app with all the essentials I don’t think this app needs anything else except for not having so many apps for PlayStation. It should all be on app, otherwise this app is great! This applies to the most recent update to the app. What is going on with PlayStation? Every time I open the app, it says my network connection has been lost. The app is unusable. This app is good but what would make it a five star app is if it gave us the option to see our capture gallery! so that we can see game clips we’ve recorded and share with our friends ! this would definitely improve the app more please consider putting in the capture gallery! I downloaded this app thinking it would be like the Xbox app, since I had recently switched from Xbox to PlayStation. I was thoroughly disappointed. There are a few key features missing from this. The most important feature in my opinion, is the ability to use your phone in party chat. After suggesting this to Xbox, they made the effort to integrate this into their application. No longer was I left unable to chat with my party mates in the event of my headset breaking. This is very irritating on PlayStation, since I currently do not own a headset, nor am I capable of acquiring one soon. Another thing that irks me is that it is literally impossible to access subscriptions through this app. I have to access the PlayStation website in order to cancel any subscription. This leads me to yet ANOTHER point. All the redirections. Please let us enjoy the app without having to have a thousand other apps on our phones. All these apps make the actual PlayStation app obsolete since everything is just a redirect. I know you won’t listen, but in order to make everyone happy, these need to be implemented. If not everything, at least the party voice chat access on mobile devices would be appreciated. I heard something about this on Android, and I’m not sure if it’s accurate or not, but we need this for iPhone. Between forcing us to buy headsets, making us jump through hoops to manage subscriptions, and forcing us to download apps that we shouldn’t need, this sounds like Sony is being unnecessarily greedy. Why is it that everything EXCEPT the store, the PlayStation plus button, and the area for PlayStation accessories are the only things we DON’T have to download separately? Prove me wrong Sony. Prove that this isn’t about money. Make the app better for the PEOPLE USING IT! Let us view our saved clips?? The app is fine and I really enjoy being able to look and see when my friends are online. One thing that I would like to see implemented in the near future is being able to view and share our saved clips off the app. With the rise of fortnite, you may want to show people your saved clips, and right now we are limited to uploading it to youtube, which I dont want to do. It will be such a convenience to be able to view our saved clips by account, similar to how the xbox app is. Please make this happen!! Please add game chat to the app as well as landscape! Also, put all the apps into one app please!!!!! There are many reasons why the previous version is better! From the trophy lists, interface, background, etc. And hey, when are you gonna make this app landscape? Been waiting forever but you guys just never make it! That's why previous better is SO MUCH better! I assumed my password was incorrect, so after changing it once and resigning in, I realized that the app itself was broken. Decided to delete and reinstall and the issue resumed. Horrible app. The only reason I got the ps4 app so I can talk with my ps4 friends cuz I have a ps4 but I can’t really play that often with them and since the new fortnite mobile came now I can play but fortnite mobile doesn’t have chat so I can’t talk so I downloaded it cuz I thought that It would be the same as the Xbox app. But it’s not u can’t talk with them and that is the only thing I don’t like about the PlayStation app. Doesn’t work half the time. Links disappear. It’s as though they’ve failed in their attempts in tricking you into buying dlc and simply made it too difficult to make basic purchases. They need to redo this completely, huge opportunity to create a reliable interactive mobile app. I’ve decided not to make purchases because of how frustrating it is to navigate. You should add a feature that allows you to remotely turn on your PlayStation. That way you can turn it on a few hours before you play so all the updates can happen. My 'Players Met' and 'Notifications' screens don't show the most recent activity, and instead shows invites and players I've run into up to over a week ago. Pulling the screen down to refresh either page does nothing, and it's a bit irritating. I enjoy this app, but Xbox just released a feature that allows you to join your friends’ party from the Xbox app. This would be an amazing and very welcome feature if PlayStation was able to do the same thing. There are times when I’m not home, but would like to quickly talk to my friends. It would be much more convenient for them because I wouldn’t have to call them or text them, I could just join the party on the go. Please make this happen! I just want to know when we are going to be able to view our capture gallery, I have some crazy game clips I want to show my friends but I can’t. Might switch over to Xbox just to use their app because it’s more user friendly. Xbox has party chat access and you guys don’t? Come on man it’s 2018. Let’s get with the times. This app is not working anymore and it won't let me sign in no more please somebody let me know what’s goin on and why I can’t sign in. I will NEVER install a separate app for messages. You’re not Facebook, put them back in the main app. When opening the app, after few seconds it shows, network connection timed out although i have active internet connection. It never works. Never even lets you sign in. Sony complicates everythinggg. Update this so i can change my profile settings. Version 18.02.0 - The back button doesn’t work when browsing the Store within the app. Wouldn’t hurt to add an “app feedback” option as well. This was the only way I could pass along this issue. Worked good for a couple months until all of the PlayStation apps stopped letting my load into the app. This is because of the VPN I was using. If you are going to use these apps, don’t have a VPN on. Best app ever I can still keep up with my status while I’m playing game from my systems. I love this app, but i recently have been trying to get into it and it’s not letting me... it saying error code something I would love you to help me I can’t even open this app!!! I think that they should add a feature where you can clips your videos on to your phone. This is a problem for me because I want to be able to make montages but I can’t . If you go to your settings on the console and switch show that you're offline the App still shows that you're online so this needs to be fixed otherwise what's the purpose! It’s too difficult to sign in every time I sign in it says it’s not connected to the network and I have 4 bars on my phone. Needs to consolidate the other apps BACK into this main one. This app used to be all in one. Now you’ve got to download separate apps to use certain things like ps messages. Well at least I’m still able to buy my games with the in app browser and when I’m done, I can close it out and be right back to the main app screen. Xbox used to have two separate apps but everything is in one for how ever long now. The app is great and all in my opinion but I was wondering if you could add to where you can view your clips from the PlayStation app and where you can upload them onto YouTube or wherever like how the Xbox app has. That’s just my opinion and I would like, for instance I can show my friends clips instead of going on YouTube (if they were on there) and showing them. There’ll be times where I’ll be in the middle of a game, either online or single-player, and having all three PS apps (Messaging, PS App, Communities) makes it super convenient to check things and message back quickly rather than having to go through the trouble of stopping in the middle of your gaming to check on your console. Everything is easier to access: profiles, trophies, messages, this app practically does it all. 10/10. Should make it so that we can transfer our gameplay straight to our phones. Not able to change profile photo. I haven’t been able to change my profile picture for quite some time now, if you try and click on the link that says “edit profile photo” a “ can not connect to server” message appears. Please fix this as I use this app more than most. Thank you. Want to use the app but actually cant. The app won’t even open. I get stuck on the loading screen until it says something about the network connection or just doesn’t try to load at all. Can’t even sign in because of error code C-800c0001, put I️t in Sony’s error code and nothing comes up. Very inconvenient. This app should not be split into 3 apps. What I mean is that removing messages and the ability to turn on your Playstation on the same WiFi should not be separate apps. The hassle of checking who’s online on this app then messaging them on the PlayStation Messages app and finally going to the wait... They removed the PlayStationLink app so now there is no way to turn on the PS4 without manually doing it. This process is not user-friendly at all and should be scrapped. This app has the potential to be the best companion app for any console out on the market but removing and making features into separate apps is not the way to go. App never works always says error has occurred, and I can never use the app. I thought it was my phone but it clearly isn’t as I have the XR. PS apps are great but there’s one thing that’s missing that would not be difficult to add to one of the many apps they have. The one reason I wanted to download the app was so I could share a video I recorded while playing Rocket League the night before. We need an app for sharing our Media Library! After downloading I was impressed with everything else the apps were capable of but disappointed it was missing something seemingly simple. Looking forward to this! Won’t let me in. Reinstalled. Same error. I downloaded this app hoping to access my ps4’s gallery on my phone. Although it is an awesome app the way it is now, the capture gallery feature would be VERY useful. My biggest problem with this app (and the PlayStation website too) is that there’s no way to save or even look at screenshots you take on the PlayStation. The app is good and can easily communicate and see what your friends are doing. The only downside is when you get a trophy it can take at least a few hours to show that you got it on this app.